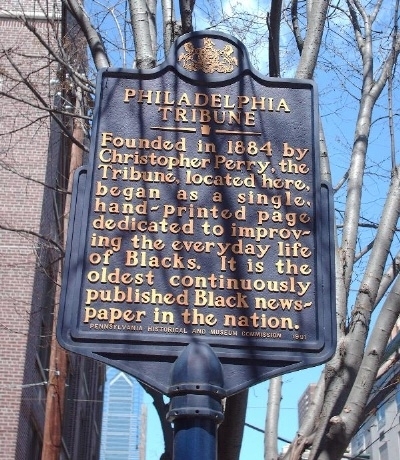 Christopher J. Perry, a pioneering black businessman who championed racial equality, established the Philadelphia Tribune in 1884. The Tribune is the oldest continuously published African American newspaper in the nation. Perry was born in Baltimore, Maryland on September 11, 1854 to parents who were free. He attended school there despite sub-standard conditions in the local segregated schools. Eventually, when he was still very young, he moved to Philadelphia. With a desire to continue his education Perry took night classes in the city, and perhaps motivated by memories of the deplorable conditions his early education, he studied diligently. In 1867 when he was fourteen, Perry began writing irregularly for local newspapers. His articles were praised highly by educated men of the city and he met with success even at this early stage of his journalism. In 1881 he began writing for the Northern Daily, a Philadelphia newspaper. Eventually he became editor of the Colored Department in another Philadelphia newspaper called The Sunday Mercury. In 1884 Perry lost this job due to the newspaper’s bankruptcy. Perry turned this unfortunate circumstance into an opportunity when he decided to establish his own paper, the Philadelphia Tribune. The Tribune quickly became one of the leading African American papers in the country. Praised for both his writing and his managerial skill by his contemporaries, Christopher J. Perry succeeded in a hard business against staggering odds. By 1930, ten years after his death, the Tribune had a circulation of over 20,000 and was noted for its attentive coverage of community issues, as well as being a vehicle for social change. Irvine Garland Penn, The Afro-American Press and Its Editors, (New York: Wiley & Co. 1891); Charles Pete Banner-Haley, "The Philadelphia Tribune and the Persistence of Black Republicanism During the Great Depression," Pennsylvania History 65:2 (Spring 1998): pp 190-202.